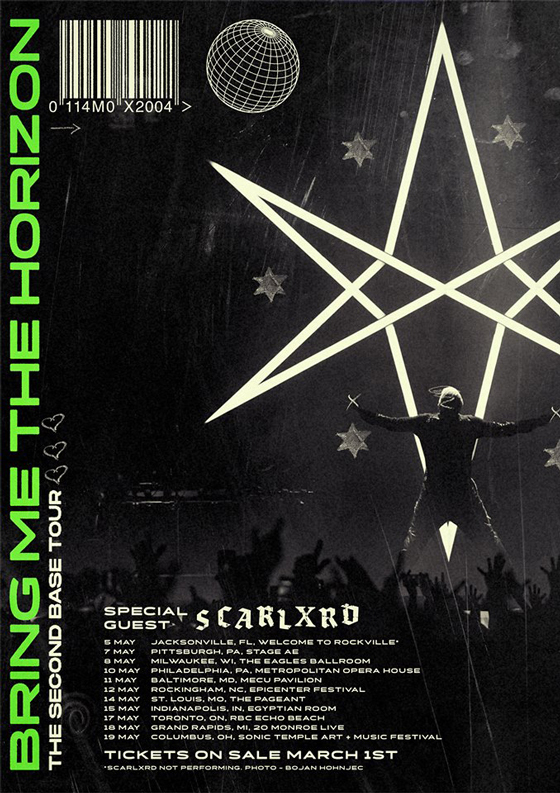 After cancelling a pair of North American dates earlier this month due to Oli Sykes' ruptured vocal cord, Bring Me the Horizon have mapped out a second run of dates on the continent that will kick off in May. The Exclaim! cover stars will begin "The Second Base Tour" on May 5 in Jacksonville, FL, playing a total of 11 dates throughout the month. Support on the run will come courtesy of English MC scarlxrd. A lone Canadian stop will bring the band to Toronto's Echo Beach on May 17. Tickets go on sale to the general public March 1, though fans can access a pre-sale today at 2 p.m. local time using the password "FALAAMO." Further ticketing details are available here. Bring Me the Horizon delivered their amo LP this past January.